Let’s play at the maths table! This is at least what I hope my pupils are thinking after I gave it a revamp this week. There was lots of exploring going on during its first day, although admittedly the children didn’t leave it quite as tidy as this! So, there are basically two games to play. The cups game is a set of paper cups numbered 1 to 10 which children can match to the numeral or numicon print outs. I’ll let you know how long the cups actually last! I resisted the urge to print out number stickers and instead I handwrote the numbers on the cups to promote the value of handwriting in the classroom (and it was quicker too). 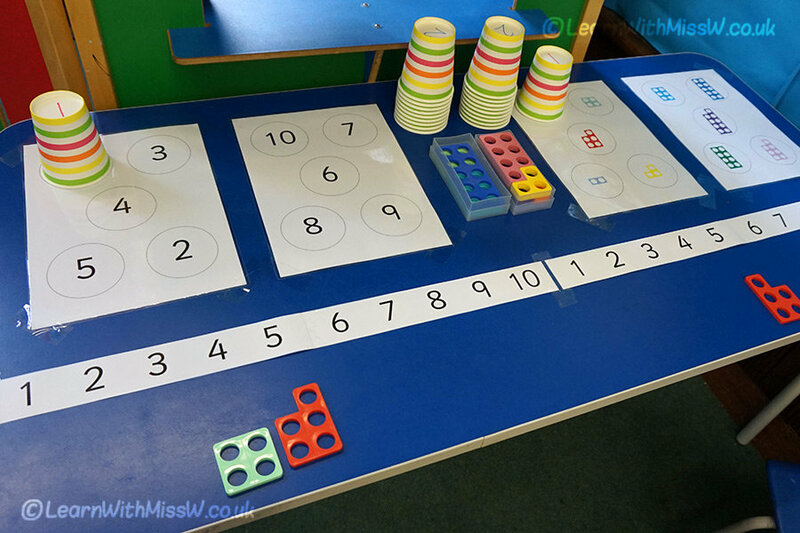 The other activity is a numicon numberline game to get children familiar with the number pieces and putting them in the correct order. This game seemed less obvious to the children and they needed a little help to get the gist of it. When packing the numicon away in their boxes, the children have been practising pairing numbers to 10. I’m looking forward to the learning conversations about number bonds and how the numbers fit together. Yes, the laminated sheets are very much sellotaped to the table. My aim is that the maths table will always look enticing and not so muddled as to put children off (which was a bit of a problem last week). Because they are matching games and everything has a set ‘place’, this set of activities is very much close-ended, in a way. Having said that, there’s nothing to stop the children ordering the cups on the numberline or putting the numicon in the numbered cups etc.